Help Celebheights by mentioning any celebrities that are missing that you think are worthy additions to the site. If you can find any quotes about their height, mention how tall you think they look, and any examples to help with guessing, that would be greatly appreciated as it helps towards constantly improving the site! Requested him before, but I'd really like to see American comedian and former Daily Show correspondant Hasan Minhaj on here. I think he's listed at (and claims) 6'0", but I believe he's probably about 5'11". Not a huge discrepency, but he really looks around the same height as Trevor Noah, maybe a .25 or .50 inch or so taller, and I still believe Noah isn't quite his listed height. @Rob what do you say about adding Chris Hansen? He's the host of shows like To Catch a Predator and Crime Watch Daily, pretty much a household name in fact. Google and IMDB have him down as 6ft 2 but I was wondering what your thoughts were. Could be that range, he actually claimed 6ft 3! ⭐️ Steve wrote such funny songs AND he loved cats! Can I request 'Small Faces' and 'Humble Pie' singer Steve Marriott? He died tragically in a fire 18 years ago to the day. He's supposed to have been small, and he was great friends with Tony Robinson; two small guys together! I have read 165cm for him. I would like to request Rob Newman, David Baddiel's former, and best, comedy partner with whom he made 'The Mary Whitehouse Experience'. My favourite sketches were the hilarious 'History Today' ones, 3 of which I have sent along. I have read 6ft and 6ft2 for him. I think 6ft is the case. You can see he has much longer legs when sitting down than David Baddiel! Rob can you pretty please add BETTY WHITE. Thanks a lot. Hey Rob I know I asked a few times before but what about a page for Christian Guzman Claims 6’0, is listed 5’11, my guess around 5’10.5-5’10.75”ish give or take. He’s a famous athlete gym owner you tuber and has his own company and clothing line I know his height is being researched a lot. @ Rob - Could Natalie Cassidy have a page please? Natalie Looks to be similar in height to June Brown and she has been on "Eastenders" since she was a child! She is generally said to be 5'3.75" - 5'4"! @ Littlelee5ft6 - That is an excellent idea, it would be a great tribute for Victoria Wood if she was given a page on celebheights! Yes, I think Tyler Jospeh is pretty near 5'9", though maybe not quite? How tall do you think the shorter one (Josh Dun) is? It would be nice if you could add them as a band, since neither is deserving of their own, individual entry, I wouldn't think. 5'11" does look too tall for Carlsen, but we'd need better pictures. Hey Rob I’m going to try again. JB Smoove height? My guess is 6’3ish(but is listed as 6’4”). Hey Rob, can you make a page for Magnus Carlsen - world famous chess player? Do you think you could add Tyler Joseph and Josh Dun of American band Twenty One Pilots? I'd requested them back on 26/Mar/19. I'm interested, because Joseph is a good example of an average(ish)-heighted guy who looks just that, which is kind of rare. I'd give him 5'9" tops; he's maybe a bit shorter. I think Dun is not more than an inch shorter than Joseph; they can often look almost exactly the same height, but Dun is also clearly shorter more often. Josh with Debby Ryan makes me struggle to see him less than near 5ft 9. Hey Rob it would be nice if you added Russian Tv host Maksim Galkin he is listed as 5’11 on google what do you think? I think 5’10.5” seems more accurate for him as he strikes me as above average. He’s also a comedy/paradoist does singing and acting as well he is married to famous Russian singer Alla Pugachova. And I was hoping for pages on every member of the Wanted. I know you have one of their heights so shouldn’t be too hard either. Could you consider a page for John Cooper Clarke, a poet who became famous in the New Wave era? He is 5ft11 but comes over as taller because he is so thin, having suffered from TB as a child, impeding the growth of his bones. He famously wears Cuban heels as well. It's part of his look! Could he please have a page? Ok, I saw this on Edge, but in Chrome it wouldn't show up! Thanks for noticing her claim. @ Sandy Cowell - Look who's arrived on celebheights, thanks for telling me! @Rob Santiago Abascal is a very famous Spanish far wing politician. If the bullfighter is 1,75 max how tall can he be? It is rare nowadays in pictures with people he looks tall, could he use lifts? Ha ha! June Brown is moaning away on a programme called 'Hard to Please OAP's'. I would SO like for her to have a page as she really is one of a kind! Her official height is listed as 5ft5.5, and she MUST be reasonably tall to have been described by Nigel (Paul Bradley) as 'tall' when he was describing the lady way back in an ancient episode when he was looking for her when she'd disappeared. I am not convinced he looks 174cm, he can give an appearance of somebody under his 5ft 8 claims. Rob, can you add famous model Hilary Rhoda? She claimed 5’11. Can you try the link again, as it didn't really go anywhere. as Rampage mentioned on Tiger’s page, I think Faldo and Singh should be added. Rob what do you think about a page for Bodybuilder and Fitness model James Ellis he claims 5’11 but he’s managed to look anything between 5’9-5’11ish he’s been on the Ellen show and a few others. I believe he looked around 5’11 give or take with 6’4/6’5 listed Tony Gonzalez in some of his photos he looks average or just above average maybe he could be 5’10ish? Although I wouldn’t rule out 5’10.5 not sure if I see 5’11 though. Wouldn’t shock me if he was 5’9 range his proportions aren’t the best. I would say he seems 5ft 9-10 rather than 11 range, but I only looked briefly. Hey Rob, how tall does Benny Gantz, Israel's former defense minister, look with Netanyahu? He's listed as being 6'4" on various articles but he looks more like 6'1"-6'2" range. 6ft 2-3 may be possible in years gone by. Rob it would be awesome if you added Russian Tv host/Actor and paradoist Maksim Galkin he is listed as 5’11, but to me he always looks a decent 5’10 guy i’d Say 5’10.5” would be a fair shout a few times he can fool you into thinking 5’11 but to me he just looks between that 5’10 and 5’11 height range. Also Actor Pavel Prelochni same thing listed at 5’11 but I think is more 5’10.5. Wouldn’t be surprised if both actors turned out to be 5’10.75 though” your thoughts? Brandon Ingram should be a good addition. 6'2" might be accurate for him at the moment, unless if I see more pics of him looking taller. @ Sandy Cowell - Celia Hammond would be most deserving of her page on celebheights, I too would love to see her added to celebheights! She has had a very colourful career as a model and she has done so much to help save as many cats as possible and to help as many cats as possible have much better lives. Rob, what about magician Shin Lim? Winner of AGT 2018 AND AGT Champions 2019 and fooled Penn and Teller twice. In his Penn and Teller appearances he looked about an inch shorter than Teller so maybe 5’7 (170cm) range? @ Sandy Cowell - Charlie de Melo is one excellent request, he is surely the tallest star on ‘Coronation Street’ and it would be great to see him with a page on celebheights! Could you do a few of the Kpopper? Sorry Rob! I forgot to mention that Charlie de Melo is 6ft1 according to my findings. She used to date Dudley Moore, Terence Stamp and guitarist Jeff Beck was a long-standing relationship of hers. I called Cordercy's little sister Cordercelia in her honour. While looking for her height, I was met with the result 'Summer is the height of the kitten season...' Ah, sweet! Then I found 173cm. Hi rob , can you do one for Connor Murphy, he is a famous youtuber, fitness model, and bodybuilder. He claimed to be 6'2 but other websites list him as 6'1. Rob, how about a page for Alex Rodriguez, now that he's engaged to Jennifer Lopez? Always listed at 6'3", but my guess is he's somewhere under that. Do you really think that Keith Gordon, who plays Arnold Cunningham in Christine, is as tall as 173cm? I don't think so, but that's what is written up for him. I am watching 'Christine', and am waiting for the chance to compare him to Alexandra Paul, who at 5ft10 seems more than 2" taller than him. I'll take a long hard look. I've seen it more times than I can remember, so I should know, but perhaps he looks smaller due to his (former) build. Keith also starred in 'Dressed to Kill' and 'Jaws 2' and is now a director. Perhaps he could have a page even? Hey Rob, could you add John frusciante of red hot chilli peppers on to the list? He seems to be slightly taller than anthony Kiedis. Hey Rob could you add Javier Botet he’s a Spanish actor known for starting in horror movies like Mama,IT,Slender Man, and REC. on google he is listed as 6’6 but on IMDb he is listed as 6‘6¾, I think he might be just 6’6 what do you think? Could you please contemplate a page for historian Neil Oliver? He has treated us to the 'Vikings' series, which I have just ordered, and 'A History of Scotland', being a Scottish fellow like yourself! I have just read that he's 5ft11. @ c-mo - Ha ha! Isn't Rocky Marciano the boxer guy immortalised by Jack Nicholson's character MacMurphy in 'One Flew Over the Cuckoo's Nest', when he has that amusing chat about fighting to one of the nicer members of the psychological team? Well, that was the first time I ever heard of him - in my teens! How tragic that Rocky died in a plane crash. I think he would make an excellent addition to Celebheights! Rob, what do you think of Bob Iger? I believe he's been requested before. Billed as 6'1" on IMDB, doesn't seem too wild imo. Hey Rob could you add David Dobrik (and maybe some of the vlog squad)? Most of his 'vlog squad' has really inaccurate claims on their IMDb pages and whatnot from what little research I've done done, and he's getting more and more well known. I know I have asked before but could you add the average height of all your celebs on your site, males and females respectively? Well since it's the 3rd time of asking, I put those facts in a quick video: Click Here. The average height for male celebs is still quite tall, of course it's influenced by wrestlers and sports entries a bit! @the conjuring I think he’s sround 6’1 but he can seem 6’1.5-6’1.75 his skinny frame fools you in videos. Rob, is it worth creating a page for the Impractical Jokers? or at least one of the jokers. how tall do you think glenn plummer is? he gets 171 listings everywhere and i guess he looks it compared to the rest of the cast here: Click Here what do you think tho? He may well be around that mark. Italian poet Trilussa (born 1871) was 1,97. @ Sandy Cowell - That's exactly what he is, rather like moi! The one person who could tell the nation how tall he is is Mr Rob Paul! Rob, how tall do you think Philip Oakey from Human League is? I've never properly looked at him yet. @ Chief stieff - Hi! Good to meet you! I'm glad you're in favour of Queen's base guitarist John Deacon to have a page, ESPECIALLY as he contributed to the writing of their excellent hit songs. His posture is always whacky and you can never see the floor or footwear but with that in mind he always looks the same or taller than Ed Gamble. One of the photos is with Jack McBrayer who always struck me as a weak 5'11" against Alec Baldwin. All of them are stood loosely but he looks like he'd be taller than Jack by a couple inches. I'd say based on these photos he looks at least 6'1", if that's how tall Ed is, maybe even close to 6'2". But then he looks about 5'11" tops next to Russell Tovey. My guess is it's an illusions caused in that shot by a footwear advantage, a slight hill, and an uneven surface, but I can't really tell. Based on everything I've seen I don't know if I can see him as low as 5'10" range. Consider adding Blueface? His high school football roster lists him as 6'3", but he could be a 6'2" 3/4 analyzing him next to G-Eazy and Adam22. @Christian He looks 6'2" next to YG and Dave East. Rob, how tall do you think William Windom was? He was a guest on the original Star Trek series--the episode titled "The Doomsday Machine." The only Queen member left is John Deacon. It seems like others, myself included, would like to see a profile on him rob. Yeah, that's what I was thinking for Michael Voltaggio; somewhere in between 5'10" and 5'11". It's weird, because before I saw the pictures I suspected him of being over 6'0". I think he should get an add simply as an excellent example of how thinness and proportions can make you look taller. @ Sandy Cowell - I agree, Nick Hewer is SO famous and I would SO love to find out how tall he is! I've never really listened to his music myself, but I have some friends who're big fans of him. Still tragic though. Hey Rob, can you make a page for ThatWasEpic (Juan Gonzalez)? Rob I know you have Diplo added what about Dylan Franchis ? He’s a Big name DJ that spiked in popularity over the years. He has a lot of photos with Diplo in some I could say they look close but he might edge him out. He claims 5’11, what are your thoughts? What would you give him as a listing? Might not be a bad claim. Oh, Rob! Nick Hewer SO needs a page! He is so funny and he doesn't even laugh at his own jokes! I think he deserves a page for his humour alone! @ Sandy Cowell - I agree that Joe Pasquale should have a page on celebheights! @ Peanut Butter - I like your name! Maybe add rapper Nipsey Hussle, who just recently was killed. It's big news out here in LA at the moment. He's listed 6'3" on websites, but not sure if he was that tall or not. He did tower over a lot of people in pics though. Maybe add rapper Nipsey Hussle, who just recently was killed. It's big news out here in LA at the moment. He's listed 6'3" on websites, but not sure if he was that tall or not. And yet in other photos he looks legitimately tall, but it's possible because everyone else is short and his thin build. What do you think? @k.A 188 yeah I'm surprised he has no page he can be a new addition for 6'7" surely. Please, Rob, can you add Rick Wakeman? I have read that he's 6ft3. Well, he looked rather huge in 'Liztomania', the first 'X' film I snuffled my way into! I actually thought I'd given him a page because I remember on some show he once said 6ft 2 and a half, but I know he also gave 2 and 3...so maybe that middle figure makes sense. Rob, what would your guess for British comedian James Acaster be? He recently appeared on Bake Off and looked similar to weak 5'10" Russell Tovey. I always thought he looked pretty tall but after seeing that I'd estimate somewhere in the 5'11" range. He could be somewhere in that 5ft 10 range. Hey Rob! Could you please add film director extraordinaire Ken Russell? Such a wonderful fellow and a genius in his own right, it would be a real gas if he could have his own page. I have read 5ft7.5, but I think 5ft6 is nearer to the point. Ken was one of the directors who broke the mould. 5ft 7 is probably reasonable, although I am sure he would have claimed 5ft 8, I need to check it again. Hey Big Rob! I want to request comedian Russell Peter’s height, who has recently been on the Joe Rogan podcast. Please could Joe Pasquale have a page? I have just found that he's supposed to be 179cm, but I think otherwise! However, he's a joy to watch and so very sweet to everybody! I am watching 'The Price is Right' on Challange TV. ⭐️ @ Rob - David Essex is about to embark on a tour, so people might show a renewed interest in his height! My favourite track of his? 'Rock On'! Edd China has no page yet ? Page for Zyzz or Christian Guzman would be awesome! How tall do you think Tyler Nixon is? He’s listed at 5’7” but next some other female “actors” I would think he’s less. What say you? Hello Rob! I've just read that David Essex, 71, is 5ft10. Do you really think he's that tall? I don't! Can I try for 'Blackadder' actress Patsy Byrne again please 🤣? Her optimum height is supposed to have been 5ft3, so it was probably nearer to 5ft2.5! I’ve seen some of Mr Beast’s videos when they were on trending before and I do believe he is a legit 6’3. If not, very close to it. Rob, can you list Lee Jong-Suk's height? Thanks! And Dun is slightly shorter (maybe 0.5" to 1") shorter than Joseph, I think. Big E and Xavier Woods would be good additions, since Kofi Kingston's already listed. Or maybe even Rowan. It does seem too much. Rob what do you think about Takeoff (american rapper) height? @Paul NS (6ft 0.5), thanks for that quoted height for Sidney Crosby. I don't think he's grown much or at all since then. I'd probably add him at 5'10.5". They give their heights in this video (and a few others), and they've often dealt with issues of physical build. I'm kind of skpetical of Eugene and Ned's claims in particular. I can believe the tallest and the shortest ones numbers, though even those may be off. But Ned strikes me as being closer to Zach's height than his claim, and Eugene strikes me as being closer to 5'10" and 6'0", but I could be wrong. Rob, can you add French actor Guillaume Canet? Pretty well known - could he be around 5ft 11? I'd be surprised if he was near that mark. Hey Rob what about Ali Ersan Duru how tall do you think he is? He’s a Turkish Actor who plays in many movies and tv shows one of his major ones is “Sultan of my Heart” he claims 6’3 or 190cm but I feel like that’s an inshoe height while he’s certainty in that fairly tall range I thought more 6’1 range like 6’1.5-6’1.75”. I hope he can get a page in the near future cheers! I wouldn't have said (just from a brief look) that he was 6ft 3, it could be a shoe height. Could you add the boxer Jake LaMotta? He's listed as 5'8'' everywhere but I think 5'7''-5'7.5'' would be more accurate for him. Please, Rob, could you consider Danny Miller from 'Emmerdale'? I have read that he's 179cm. He is notably shorter than screen hubby Ryan Hawley. He plays such a nice and thoughtful character. 179 for me seems too high. Rob I know you have some Bollywood actors added but could you add Arjun Kapoor he’s been in many moves like Mubarukan. He’s listed at 5’10 on google however I think he might be nearer 5’11 if not the full 5’11 he always has an above average /tallish vibe and wouldn’t be surprised if he could be 5’11 range. What do you think I know plenty of fans would be happy if he was added. That looks a bit of a lowball for Arjun, I looked at him in the past and wasn't so sure because I got a feeling he was easily 5ft 11-6ft range, maybe I need to look at him as he is a big name in India. Rob,have you seen 6ft9 ike catcher!? that guy is unbelievable agile and quick for a guy of his size he dwarves 6ft5 Ralf moeller he really needs a page. Greg O Gallagher 5’9.75?” Measured but claims 5’10. Maxx chewning Claims 5’10 can seem 5’9.5-5’9.75 next to 5’10.5ish Guzman perhaps? @ Rob - That wouldn't half be an exciting addition! Having been watching 'The Last Fast Show Ever' with my boyfriend yesterday, I was thinking what a huge part she played in it AND her acting career has stretched into film work now. Hey, Rob. What do you think would be Jair Bolsonaro, the president of Brazil, height? He just visited the white house. There are some photos of him with Trump and John Bolton that you can see in order to estimate his height. Could look 182cm with Trump at times. ⭐️ Arabella is starring in the new Keira Knightley film 'Colette'. That'll be a superb opportunity to compare her to Keira! @ Rob - Please could you consider a page for Arabella Weir? I have read she's 5ft6, but I never thought that she's quite as tall as that! I'm watching 'The Last Fast Show Ever' and I'm waiting for a chance to compare her with Caroline Aherne, but I don't think she starred in that particular showing. I'd say about 5ft5; noticeably shorter than Paul, but not to the degree that Caroline is. I replied once about her I think last year, she's 100% not 5ft 6, I might consider a page. Consideration for a page for Christian Guzman Rob 5’10.5? Is my guess as he claims 6’0. Also perhaps Said Savershayian aka chestbrah Zyzzs brother claims 5’11 but many people think he’s 5’8-5’9 has even been called out on his Facebook page as “5’8 being the new 5’11” also Zyzz claimed to be measured 187cm but he looks legit tall in all his photos so maybe 184-185cm or 6’0.75-6’1. Rob, can you add Liverpool FC fullbacks Trent Alexander-Arnold and Andrew Robertson? They're listed elsewhere online as 5'9" and 5'10", respectively. Jenny made a couple of birthday cards for Andrew Robertson in the past, well on behalf of a relation of his who asked her...I wonder if he liked them! He could be 5ft 9 at most. Could you add rafa marquez, Mexican soccer leyend & captain 10 years in barcelona 2 times champions league winner, i think he is 181 cm, also alexandre pato please. Dennis Bergkamp: certainly 187cm-188cm range. Rob, could you add Keith Duffy and Shane Lynch from Boyzone? Keith was described as 6ft1 but looks a little shorter than Brian McFadden (solid 6ft1) and Shane Lynch was listed 6ft but actually looks taller than Keith. Maybe those are in reverse? Hey Rob! I have just read that Deep Purple bassist, Roger Glover, is taking place in the London Marathon! Whether it's true or not I am by no means certain - the guy is 73 - but that has awoken an interest in how tall he might be. I have found 180cm and it's doubtful they'll be talking about his height after ageing, but if he is fit enough to take part in the 26-mile run, he's going to be anything but a crinkly old man! I have sent along some pictures of him! I think 180cm is possible for his peak. @Rob: Did you get a chance to look at Ted White? If so, what would you guess was his peak height or at least his height around '84 when he made Friday the 13th 4 and Starman? I've not looked at him yet. Hey Rob can you add Garance Mariller from the movie Raw, it’s a French horror movie. On IMDB she is listed as 5’4¼ I think she might be somewhere in that range what do you think? 5ft 4 seems possible, though that film's female director looked very tall beside her, like near 6ft. I thought this chap could seem over an inch taller than someone like Corden. Rob, can you add Siddarth Malhotra please? He looks quite tall, taller than 6'0" listed Jackie Shroff (assuming Jackie Shroff has lost no height). Hi Rob, would you consider adding Chinese rapper Kris Wu? He is listed on many sources as 187, but he looks to be a weak 6'1 guy in my opinion when compared with other celebs in the pics below. Kris looks very similar in height with Shawn, but Shawn has a looser posture and camera angle disadvantage in this photo thus looking a tad shorter. Might look almost 2 inches shorter than Russell here. Please also list kim rae-won, Rob, thanks! @MD: In the book Sidney Crosby: Taking the Game by Storm, he's described as measuring 5'10 3/8" at two months shy of 18. Hey Rob. I know you have Bono’s height at 5’5.5. How tall do you think his bandmates Larry Mullen Jr, and the Edge are? Could be 1.5-2 inches taller than Bono. Another request. Can you add Grammy-award winning Spanish singer Alejandro Sanz? Someone posted these pictures of him with various people on David Bisbal's page last year that I think would be very helpful. With 17 Latin Grammys and 3 regular ones, I think he more than qualifies to be added as a major singer. He looks quite tall, at a very max of 5'6", but likely shorter. Rob, why not add Giannis Antetokounmpo, there is a picture of him and 6'9.5 Kevin Durant after the all-star game, and he looks to be a little taller I'd say 6'9.75-10, he is a bit shorter than Anthony Davis in my opinion. Thanks, Rob, for Roger and Leigh Whannell! @ Sandy Cowell - I always thought that Leigh Whannell was close to 5'7" although I wasn't sure that he was exactly 5'7"! One thing we know is that Rob knows, you know! Now we know! Rob, lee min ho is listed at 187 but compared to 182 kim rae won they are a the same height. Im curious rob so please list lee min ho's height, thanks! Can you do Scottish footballer Ryan Fraser who plays for AFC Bournemouth? Such a dynamic and highly skilled player, who is listed at 5'4", but my guess is he's a bit shy of that. He's currently second in assists behind Eden Hazard. Great to see him flourishing in the Prem! I'm curious to see how accurate these listings are. They give their weights in the video, too, but the heights might just be claims. For instance, 6'0" seems a little high for Eugene, I think; Zach's seems about right, Ned's is probably about an inch too tall...I wouldn't give them each their own page, but all of them together. I have sent along some pictures of Patsy Byrne at varying ages, and looking through some more 'Blackadder' episodes, I have discovered that she was Nursie, as well you know, in 'Blackadder II' and appeared as such in 'Blackadder's Christmas Carol' and 'Blackadder Back and Forth'. She also makes an appearance in 'The Blackadder', but I have to check out exactly what she was called, if anything at all! She might have played one of three Shakespearean-style 'hags' with the late Gretchen Franklyn, of 'Eastenders' fame, whose optimum height was 5ft1 and she passed away measuring 4ft11 at the most. Patsy also played alongside Patricia Hodge as another 'nursie-type' figure in 'Inspector Morse'. It would be lovely for her to have a page. Her laughter lit the whole room up as did her demeanour! Rob, please add NBA player Jimmy Butler. Here is a photo with 207cm Kevin Durant. Also, what's my true height if I'm 5'9" in the morning. Leigh Whannel: the guy who wrote the Saw movies. Garance Marillier: she was in a French horror movie called Raw. Hi there Rob! Please can I request the heights of Queen's Drummer, Roger Taylor, who I have just read is 179cm and John Deacon, bass player, who I found to be 180cm. The same source said that Freddie Mercury was 5ft10, so it might be wise to deduct an inch per fella! With the new Queen West End production doing so well, I think they might be names of interest to many Queen fans. He's been asked a couple of times. But also...I’ve noticed that people who are underlisted on the web tend to draw more traction on here because they’re less common than those that are usually overlisted. If you do consider him eventually, I think 6ft1½-2 range is believable, possibly even start him out at the top end of that. Like Norm MacDonald who also got 6ft1 but is nearer 6ft2. He had the same tall, angular features that Gwyneth has...strong resemblance. I can make exceptions for people who don't get searched much if there is something like a quote I find, but as of yet I haven't come across one. Can you add Barron Trump. He seems to be as tall or even taller than Donald Trump. Would be nice to see a listing for Christians Guzman 5’10.5 more or less, Maxx Chewning 5’9.75” or so and Greg O Gallagher at 5’9.75” measured 177cm a few hours out of bed. Rob, can you add Roger Taylor? I would love to put an end to speculations about his height. Can you add famous NHL hockey center Sidney Crosby? He's the long-time captain of the Pittsburgh Penguins. I seem to remember him being listed as 6'0" earlier in his career, but has consistently been listed at 5'11". I imagine this still might be a bit too tall. He looks very average-heighted to me, but I could be wrong. Vic Morrow, actor and director, is listed at 5’9 on google but has an ambiguous height that I can’t seem to pinpoint. At times he looks much taller in Combat! alongside costars. @ Nik - But I thought he was Five Seven!😖🙄😂🤓😏😣 - Leigh Whannell! Sorry I couldn't find a clip of Larry claiming 6ft 1 himself, I tried going through his and Jujimufu's videos but many are about 20 minutes long, it's definitely in a recent collaboration with Jujimufu. I'm sure I came across it once, at least he wrote the 6ft 1...it's believable enough, he looked taller than arnie over an inch with worse posture. @ Sandy Cowell & Rob - Leigh Whannell is the creme de la creme! Even my autocorrect knows his name! @ Sandy Cowell - Leigh probably is somewhere around the 5’7” mark, the thing with celebheights is that Rob deals with accuracy! 5 foot 6 5/8 ? 5 foot 6 3/4 ? 5 foot 6 7/8 ? 5 foot 7 1/8 ? 5 foot 7 1/4 ? 5 foot 7 3/8 ? @ Sandy Cowell - Leigh Whannell NEEDS a page, he really is one of the most decorated and talented celebrities in the film industry! Rob, how tall do you think Jon Tenney is? He's worth adding, I can believe he could look over 6ft almost 6ft 1. What about Bryan Dechart? This actor is currently very famous for the videogame Detroit: Become Human. Hey Rob, how about pages for Bad Bunny and the second half of Rae Sremmurd, Slim Jimmy? I'd say Bad Bunny looks around 5'11 range and Slim Jimmy looks around 5'5.5. Please, Rob, can we have Leigh Whannell? Starring in the film 'Saw' and the 'Insidious' Quadrilogy, he's got an amazing career going for him. He is written up as 5ft7 - and looks it! Hey Rob, seeing Nick Castle made me think actor/stuntman Ted White would be a good guy to add. He's best known for playing Jason in Friday the 13th Part 4, which wrapped up filming the same month Ted turned 58! You can hear Ted claiming "I'm 6-foot-4 and at that time was 230 pounds." Click Here Ted was also 58 when he had his memorable supporting role in Starman and I'd guess he was a minimum 2" taller than 6'1.5" Jeff Bridges, I had thought possibly 2.5"-3" taller watching the film a while back. Here's a timestamp to their scene on youtube: Click Here Granted, Ted was wearing a pretty normal work/hiking boot, which I'd think was around 1.25", but Bridges appeared to wear Converse throughout the film so we likely have to deduct at least a half an inch, but I'm sure Bridges cap added at least that much. Here's a pretty good still of White with Bridges: Click Here Looking at the background, the photo appears tilted against Ted, who also isn't standing as straight as Bridges. A 58 year old Ted looked 6'3" at the very least and I'd guess more 6'3.5", if not 6'4". There's certainly no guarantee a stuntman will still be at their peak height at 58 so it makes it even easier to buy that Ted was once the 6'4" he claimed or very close to it. Here's an old photo where he's clearly taller than 6'2.75" listed Cesar Romero: Click Here It stands to reason he was a very big man having doubled for John Wayne, Rock Hudson and Fess Parker among others and in fact his size was what got him cast in Friday the 13th. Here's a photo from 2018 where a 92 year old White doesn't look that much shorter than Kane Hodder considering Kane is undoubtedly wearing some kind of thick boots: Click Here Also note C.J. Graham looking considerably taller despite standing behind Hodder. I might have a look at him next week. for you Viper, I will consider adding this guy, as I have watched some videos and can see he may well be a top player in next few years. But surely he grew a bit since 6ft 5 barefoot? SnerhagAip777, Karl Lagerfeld said he was 5'9 in his prime. @Bwk I asked Rob to add Greg too he said he might, personally I’ll give him a weak 5’10, 5’9.5-5’9.75” he looks a lot of the time also Christian Guzman not the 6’0 he claims or 5’11.75” he’s probably 5’10.5” which would make Maxx Chewning 5’9.75” also what’s your guess on Mike Thurston Claims 5’11, but I think more 5’10 range same with Freezma. @Tree Juji Claims 5’11, I thought he wasn’t that far off his claim could be 5’10.5” and just rounds up. Or could be claiming an in shoes height but I thought he was a weak 5’11. Hey rob could you add Brandon Quinn he was an actor on the big wolf of campus; how tall do you think he was? I am not that familiar with him. I haven't seen a page on NBA centers in a while. Some suggestions could be Demarcus Cousins, Hassan Whiteside, or Nikola Jokic. when will you add barry bonds rob? Rob, can you make a page for Luka Doncic, the Slovenian professional basketball player from the NBA? He is listed 6'7 in wikipedia and in the official site 6'7 as well. Lately he has been getting a lot of popularity. 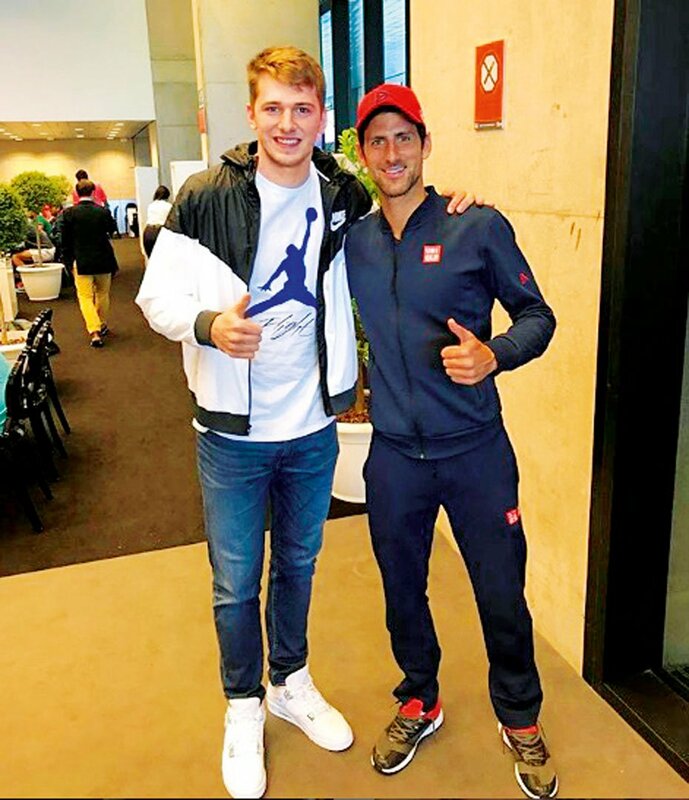 I remember also With Novak I wasn't convinced he looks a big 6ft 7 guy, though at times he has looked anywhere from 6ft 6 to full 7. Might be interesting to see what others think of him as he's almost 20 now. Karl Lagerfeld should have a page. He looked slightly shorter than Kendall Jenner, at least an inch. So he was likely not any taller than 5'8 if anything. No idea about peak height my guess is a fraction less than 5'10. He was rarely taller than the models he was seen with. Certainly at most 5ft 10. Dear Rob,I recently found out that the famous basketball player ray allen was measured barefoot at 6 ft 3,5 for the olympics games. This could be helpful to judge better some tricky heights you have on this site. Rob,what's your guess on these 3 after seeing these pics? Ray can look near 6ft 4 generally, but I don't know if he was actually measured for Olympics at that 6ft 3.5. @Guru Guy I believe Beau was measured at 7’0.5” by his friend yeah a lot of people having been requesting him would be nice. Rob been asking for a over year now, could we get Sam bunkall a page? I never managed to look more than briefly at him. Hey Rob, can you make a page about Devon Larrat - a famous Canadian professional armwrestler. He has been a world champion at it. In his bio it says he is 6'5 and he has been listed that height for a lot of his matches. I think 6ft 4 is a lot more realistic than 5, I know he was asked about before a couple of times and maybe I will give him a page. You should consider making a page for fitness Youtuber Greg O'Gallagher Kinobody. He claims 5'10" but has been measured at 177cm flat and 177.5cm and both measurements were probably done a few hours out of bed for a dexascan. I think his height is probably around 5'9" and 5/8ths. Plz Can you add bollywood actor kartik aryan? Could you please consider Simon Day again? I have sent along some pictures from 'The Fast Show', comparing him to Paul Whitehouse, Charlie Higson and John Thomson. I really do think that he is 6ft2, at least he will have been in the 90's. Yeah I do remember him from Fast Show, I will have a look. He strikes me as maybe a strong 5'10". I've noticed a lot of the NASCAR guys are often overlisted by at least two inches. Another one is Denny Hamlin who's listed at 6'0" but might not even be 5'10". 5ft 10.5 maybe possible, I just looked and saw a quote from him, so since there are very few drivers and he is more well known, I shall add him, at least to get rid of that 6ft listing from the web in the future when others change it. Rob, it would be beneficial to have a page solely for strength athletes. Currently, many of the powerlifters and strongmen you've added to the site have no designated spot. I would need to look at him again. I simply don't believe Jean Slater is a mere quarter-inch below 5ft4. It completely threw me off who I was looking for, and that was Stacey's newly reintroduced friend, whose quite a bit smaller than Lacy's character. In fact, I'm quite surprised that I can even remember who I was searching for because of what I read when only recently I'd been thinking how small she is. I would have said 5ft0.5. She'd probably tell me to shove off, but I see what I see, and came across 'Jean' purely by accident! This is irritating me as I'm trying to enjoy the star-studded 'Red Dragon'! Do you think you could give me your expert viewpoint on the matter please? Also, as she's been a long-suffering member of the 'EastEnders' cast for years, do you think she ought to have a page? After my film, I'll try to hunt around for some pictures and forward them on. Thanks Rob! What a funny Friday night conundrum! I had a quick look and I don't think she is far off 5ft 3 at first glance. Hey Rob I know you mentioned you would consider a page for Athlete You tube Star and gym owner Christian Guzman, he claims to be 6’0 but I think we can safely say he isn’t, this girl is 5’11 and she seems to edge him I noticed he’s dropping posture as is she. I asked her what she’d guess him at she said maybe 5’11 if he stood up straight but I’m thinking a 5’10.5-5’10.75” listing would fit him more? Click Here I’m seeing a weak 5’11 guy here. This would make Maxx Chewning 5’9.5-5’9.75”. I don't know if she's dropping as much as him, because she is rising on her toe...rather than keeping feet flat and bending one knee which can lose some height. Re: Frank Finlay - Thanks ever so much, Rob! Slight Correction:- I wasn't writing on Celebheights until late September, 2016, so poor Frank had already passed on when I'd started commenting. I wasn't that surprised frank had himself at 5ft 9, but I doubted, having a brief look at him whether he really was that height. Here's a little more on about Patsy Byrne. She was basically a classical actress, starring in 'David Copperfield' (with Bob Hoskins), 'The Old Curiosity Shop', 'Romeo and Juliet', 'Hard Times', 'As You Like It', 'The Chronicles of Narnia', an episode of 'Inspector Morse' with Patricia Hodge, 'Stealing Heaven' and 'Britannia Hospital'. Then, of course, she played Nursie in 'Blackadder II' and 'Blackadder's Christmas Carol', and can be spotted, I believe, in the first Adder series. Now that Matilda Ziegler has finally shown up in 'Classic EastEnders' as Kathy's mystery daughter, I thought I'd do some hunting around about this actress, who I never tire of watching playing Mr Bean's will they/won't they girlfriend! I found out that Matilda has also starred in 'Lark Rise to Candleford' and film-wise, the brunette has appeared in 'City Slacker', 'Decadence', 'The Audition' and more. showings of the loveable 'Mr Bean'! Then I have found out written evidence that she's (a convincing) 5ft5. Please can we have a page for her Rob? Rob, could you add more professional wrestlers to your site? Well, I went on to discover that Frank peaked at 5ft8. He looked a good deal shorter than your average 'Blackadder' cast member - I did notice that - and I put him at around 5ft7. I remember when I was babysitting in December '77, and I watched a Dracula production with Louis Jourdain playing the lead part. Frank was also in that. Do you think Frank Finlay could have a page to pay a tribute to his greatness? 'Blackadder' addition is the last thing on my mind, but I am glad that watching this first series, which I've never watched properly on my own, brought my attention to him. Jim Toth. He is Reese Witherspoon's husband. Google has him at 6'1". He looks right around it maybe a 186er. He is the lead singer of the British band Bastille. He is listed at 6'1" on google and in cms 186, he looks around that. You should make a page for rapper Juicy J. He's listed as 6'0'' everywhere and I'd say that's spot on for him. @ jjleppfan - Black Francis from rock group the Pixies is an excellent idea! I'd need to think about that one. Singer James Blake. Listed 6'5" on the Internet but I doubt he's actually that tall. Hey Rob, now since you have done more youtubers recently, I was thinking that you could give Kristopher London a page. Also like Greg said, I'd like to see Beau Brown also on here. Both guys are extremely tall, and would make a great discussion. One of the most well-acted roles in 'Prince of Darkness' was played by the toweringly tall Jessie Lawrence Ferguson, who takes the role of Calder and has the creepiest laugh imaginable! Jessie also played Luton in 'Star Trek: The Next Generation' as well as appearing in 'Boyz in the Hood'. I read he is 6ft5! Do you think this outstanding actor could have a page on Celebheights please Rob? Thanks! Also Beau brown could be added to the catagory of Giants he claims 7’1, and got measured 7’0.5” by his friend. The measurement seemed honest and he’s always ducking under doorways and his head almost touched true ceiling. what about actor James ransone rob? please could you add this one I think he may be worthy a page. The late Victor Wong was 5ft4. '3 Ninjas', 'Big Trouble in Little China', 'The Last Emperor', 'Seven Years in Tibet', 'The Golden Child', and perhaps my favourite is 'Life is Cheap...but Toilet Paper is Expensive'! I think he is deserving of a page please Rob! Samantha was best known for her part in 'London's Burning'. She is 172m.tall.. Please could you add western character actor and Sam Peckinpah regular L.Q Jones? I've seen him listed as 6'2 in places but this is incorrect he himself describes himself as 6 foot which if you watch his movies seems about right. Seems just as tall at 91 as when he was younger too! I'm listening to a rather smelly, cat-soiled copy of REM and I came across a song with Michael Stipe singing along with Patti Smith. I asked Google her height and I was told - very politely I might add - that the singer and poet is 173cm tall. Please could she have a page? I'll never forget listening to 'Because the Night' when in my teens, a song penned by Bruce Springsteen. Hey Ho - Here she goes! Please, Rob. could we have Andy Warhol? Yesterday I had a real freak-out! I couldn't find my lovely white pussycat, Erramius. I looked everywhere for her, and I was crying my eyes out. She turned up on my bed! She's a beautiful little thing, and I know you'd love her! Also I think Christian Guzman, Bradley Martyn and David Laid would be honorable mentions. @Rob how tall do you think Caleb McLaughlin might be right now? If you look at a recent photo from a couple of weeks ago Click Here. He's next to WIlliam Baldwin I believe, a 6ft 2 man, so I'd say he might be 5ft 6. Sandy, my love! I am busy with my lessons. I love you! You should make a page for Youtuber Sean Evans host of the Youtube Show Hot Ones. He's claimed on Instagram that he's a ''tall 5'9''/soft 5'10'' but he looks shorter than most of the celebrities that come on his show. He looks more around 5'8''-5'8.5'' rather than 5'10''. 5'9'' flat is the tallest I can see him at. Hey Rob what about adding Greg O’Gallagher from Kinobody he’s a successful fitness trainer and model. Many people search him up including his height? He claims 5’10 but on a you tube video for his dexascan got measured at 177cm or 5’9.75” I would listed him as either 5’9.5-5’9.75” as I think that measurement was a few hours out of bed. He's one of those 'possible' names. The fact he got that scan at 177 means I could consider him in future. Could you also add Calfreezy (their friend) who claims 6'3? Rob, can you make a page about Ninja aka Richard Tyler Blevins? - The famous fortnite streamer and youtuber? He claimed 6'2 1/2 in one of his streams. I did think about this guy, didn't realise how many followers he has nowadays! Beside someone like Fallon I could see 6ft 1.5 or 2 as possible. Yes, he did a rather brilliant take on Bob Harris! I met him when he was watching a football match! (Mr Harris) When he stood up, I nearly passed out! What about Christopher Jackson, done loads of music and acting now in Bull. Claims 6’2 on twitter but actually looks shorter than Michael Weatherly. Yeah he is worth adding, Jenny liked that show. He did look shorter indeed. An mma addition that might be nice is former welterweight champ Robbie Lawler. Listed 5'11. As is Dana White who probably needs a page too for comparisons sake. Only pic of Lawler with a listed athlete I could find was with Nick Diaz.